PreK Informational Meeting Thursday Feb. 28 at 6:30 p.m. The Solvay School District operates a Prekindergarten program for 4 year olds. We are currently registering students for the 2019-20 school year. We strongly encourage you to enroll your child in our program if he or she will be 4 years old by December 1, 2019. 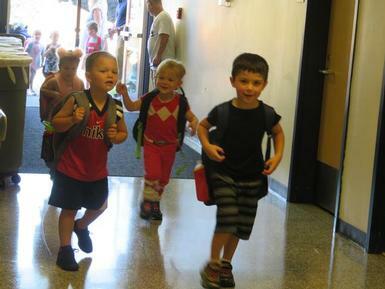 The PreK program operates Monday – Friday, for 6 ½ hours, and will follow Solvay school district calendar. There is no charge or fee for your child to attend the PreK program if you reside in the Solvay School District. Transportation is provided for students once they are 4 years old. We have scheduled an informational open house for Thursday, February 28, 2019 at 6:30 PM at Solvay Middle School Library, 299 Bury Drive, Syracuse, NY 13209. This session is open to all parents residing in the Solvay School District who have pre-school age children, ages 0-4 years old. If you would like your child to be included in a PreK class or have questions, please contact the Solvay District Office located at 299 Bury Drive, Syracuse, NY as soon as possible. Please call 468-1111 option 2. We would like you to complete the registration process by April 1, 2019. We are pleased to be able to offer you and your child this wonderful opportunity. We look forward to seeing you on February 28th.